Mall That: Dong Phan (left) and Duy Nguyen at work at the Grand Century Mall. I'VE NEVER been to Vietnam, but I fantasize about it. Mainly, I think about the food. I imagine walking through Ho Chi Minh City's Ben Tranh market as a heady lunchtime aroma hangs in the humid air. I picture an old woman ladling out aromatic bowls of pho. Nearby, there's a family manning a lunch counter, serving bowls of rice porridge with eel and vegetables. On a street corner nearby a comely woman turns pork and chicken skewers over a charcoal fire. I eat and eat. I don't know when my food fantasy will come true, but in the meantime there's Grand Century Mall in San Jose. If ever there was a reminder of Silicon Valley's connection to Vietnam, the Story Road mall is it. Last month marked the 30th anniversary of the United States' ignoble withdrawal from Vietnam and the North Vietnamese Army's takeover of Saigon. Obviously, the events had a profound effect on the country. We felt the impact here in various ways as well. Tens of thousands of Vietnamese fled the new communist regime and headed to the United States. Most came to California. Today, San Jose has the largest Vietnamese population of any U.S. city. As a result, we have outposts of Vietnamese culture like Grand Century Mall. In many respects, it's a regular old mall. There are stores selling jewelry, plants, clothes and DVDs. But it's the food that makes the place stand out. Forget Panda Express. The food court here offers a wide variety of cheap, Vietnamese food that's the next best thing to the market stalls of Ho Chi Minh City or Hanoi. The row of nearly a dozen restaurants offers everything from noodle soup to tapioca flour desserts. The communal benches are packed with a mainly Vietnamese crowd savoring the tastes of home, or for some, their parents' home. The ding-ding of bells alerting customers that their orders are ready periodically interrupts the buzz of conversation. Over the course of two visits, I visited a half-dozen food stalls. One of the most crowded and best is Dinh Cong Trang. The restaurant specializes in bahn xeo ($5.50), rice flour pancakes tinted yellow by turmeric. The pancakes, really more like thick crepes, are slightly sweet because of the addition of coconut milk and pleasantly blistered along the edges and filled with bits of pork. Served alongside it is a mountain of crisp green-leaf lettuce, bean sprouts, jalape-o peppers, various Asian herbs and vinegar-spiked fish sauce for dipping. What you do is roll up a piece of the pancake and a sprinkling of herbs and other condiments in a lettuce leaf and dab it into the tangy fish sauce. Also good here is bahn canh ($5.50), pig's feet soup (charmingly called "pork hand" on the menu), rice noodles in clear, clean broth. A few counters down is Nha Trang, a restaurant that touts its spring rolls ($6) filled with pork patties, rice noodles, herbs and pieces of vegetarian fried egg rolls. The chewy, clean flavors of the rice paper wrapper contrast with the savory, crunchy goodies inside. Next door, Thuan Phat sells a simple but good roast pork banh mi for $2, a thin French roll sandwich packed with cucumbers, cilantro and jalape-os but not the typical shredded carrots. Although I found it too doughy in my already full belly, Thuan Phat's banh bao ($2), a big fluffy steamed bun filled with pork and eggs, makes for a filling and quick snack. On the other side of the mall, Tay Ho offers a sit-down restaurant experience with waiters but the food is just as good and cheap as the food court offerings. Bahn hoi tom thit nuong ($6.95) are square cakes of fine rice noodles served with excellent grilled pork and shrimp served alongside a salad bar's worth of lettuce, bean sprouts and herbs. The idea is to make a kind of lettuce taco by mounding a noodle cake with bits of pork and shrimp and a sprinkle of herbs and dipping it all into the excellent fish sauce. I also liked the aromatic bun bo hue ($5.25), a spicy rice noodle soup with big chunks of pork and beef shank. Back over at the food court, I was looking for dessert. 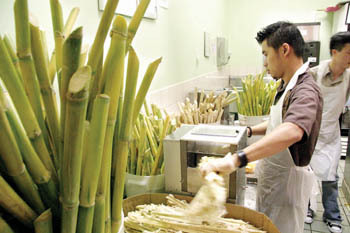 Nuoc Mia is sure to satisfy your sweet tooth with fresh-pressed sugar cane juice ($3). The juice, pressed from the cane before your eyes, is available plain or with dozens of fruit and vegetable juices. It's like a Vietnamese version of Jamba Juice. On its own, cane juice has an earthy, syrupy sweetness that's quite refreshing. For something more exotic, head to the far end of this mini-restaurant row to Hien Khanh Dakao. I confess to being lost in the sea of tapioca pearl, gelatin and puddinglike desserts in the display case at this sweet shop. So I ordered the strangest-looking thing I could find. In this case, that was several lumpy white balls afloat in a clear liquid. A closer look revealed a lazy bubble or two rising in the plastic cup like an Alka-Seltzer tablet running out of gas. Encouraged by the lady behind the counter, I paid $2 for the dessert and a glass of Vietnamese iced coffee ($3.25). The dessert is question is called com ruou, which translates as rice wine. The lumpy orbs turned out to be rice balls and those bubbles denoted fermentation, hence the rice wine name. The rice balls were pleasantly sweet and had a surprising effervescence, fizzing and tingling as I ate them. The liquor in the glass was sweet and packed a mild but distinct alcoholic kick. Because I knew I'd have trouble enough staying awake given the quantity of food I'd eaten, I put the com ruou aside and sipped my iced coffee instead. I've laid off coffee in favor of tea, but I have a soft spot for Vietnamese coffee. I remember it being potent, but Jesus, this was like an IV of caffeine straight to my aorta. Oh, but it was good. As the coffee continued to course through my system hours later, I savored my homegrown Vietnamese culinary odyssey well into the night. Address: 1001 Story Rd. at McLaughlin, San Jose. From the May 18-24, 2005 issue of Metro, Silicon Valley's Weekly Newspaper.